Foodies, rejoice! 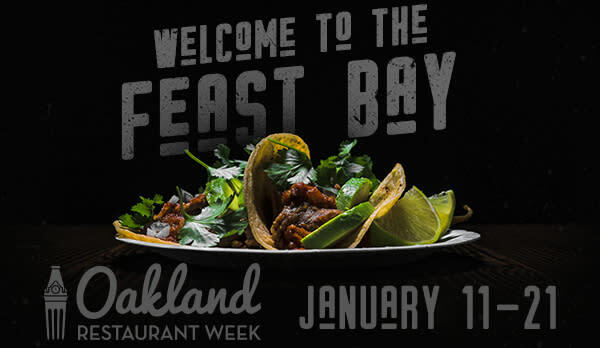 It&apos;s time for Oakland Restaurant Week in The Town! For ten glorious days in January, 80+ restaurants will offer special prix fixe lunch & dinner menus at $10, $20, $30, $40 and $50 price points. To ensure you make the most of The Town&apos;s feast, here are some top tips for picking and choosing the restaurant that&apos;s perfect for you! Cut down on research. Take advantage of Visit Oakland&apos;s new website and utilize the updated search categories and filters to find new types of cuisine and menus. Check social media for giveaways. A lot of our partners are offering Oakland Restaurant Week giveaways on social media. Follow #ORW18 for more details. Explore new neighborhoods. We&apos;ve got restaurants from over 17 Oakland neighborhoods. This is the week to do some exploring and eat somewhere you&apos;ve never been before. Don&apos;t be afraid to try something new! Unless you&apos;re living under a rock, you&apos;ve probably read about the dozens of delicious eats in Oakland. We&apos;ve got tasty newcomers such as Navi Kitchen, Slainte, Reem&apos;s California, Bird & Buffalo, Mockingbird and The Kebabery. Bring a friend to one of the Oakland Restaurant Week veterans like Bellanico, Flora, Lungomare and Howden Restaurant & Bar, Spice Monkey. Book your reservation with OpenTable. Once you know which restaurant you want to try, why wait? Book your table and skip the line. Feast your eyes! Share your meal on Instagram using #ORW18 for a chance to win! The buzz has already begun for the 8th annual event the biggest Oakland Restaurant Week to date. So put those New Years resolutions aside for one more month and start planning your Oakland Restaurant Week itineraries now! Lungomare- Located in the heart of the Jack London Square waterfront district, Lungomare offers a menu complete with Italianate culinary stylings and a from-scratch farm-to-table mantra that’s taken as seriously as its European counterparts. Just minutes from Oakland’s busy downtown, Lungomare is a world away – outside, a large glass-paneled patio hosts a luxurious fire pit for comfortable marina watching. Inside, a full bar and lounge features handmade craft cocktails, Ligurian wines and custom brews from Oakland’s very own Linden Street Brewery. The menu showcases a spread of local fare from the Cinque Terre region of Italy – whole fish preparations and the occasional pig roast steal the show while house made pasta and ravioli are comforting classics that everyone can enjoy.